The day her father died of cancer, author Ann Marquez swore she would never again step foot inside his house. Two years later, after receiving a call that her Step-mum had passed away, she realized the need to serve as alternate personal representative to the ongoing probate of his estate. And the need to return. She had assumed and imagined that with cooperation from others, the estate would “quickly and efficiently” close. Instead, confronted with secrecy, mystery, and hostility from people she’d never known, the situation turned precarious and bizarre. During the next three years she unexpectedly took on many additional roles, including forensic accountant, detective, archeologist, liquidator, salvage/waste management coordinator, and maintenance technician. Marquez chronicled her experience in her book Journey into Probate and Back: a collection of resources intertwined with personal stories that demonstrate how even the best-laid plans often go astray. 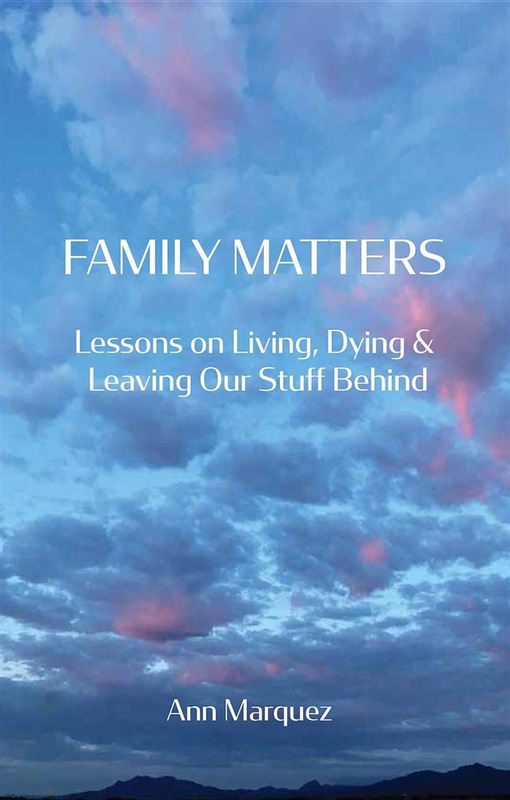 Ten years after publishing that first account, and with constant encouragement from friends and readers alike, ***Family Matters: Lessons on Living, Dying, and Leaving Our Stuff Behind ***is a new edition, tightly focused on those stories and the lessons learned. With quirky humor and honest emotion, Marquez walks the reader along her journey, helping them to understand there’s so much more to end-of-life planning than preparing a will—and so much more to life than our possessions. These are the things no one warns about—the things no one talks about. *Family Matters *offers life-affirming wisdom on a difficult subject. Acquista Family Matters in Epub: dopo aver letto l’ebook Family Matters di Ann Marquez ti invitiamo a lasciarci una Recensione qui sotto: sarà utile agli utenti che non abbiano ancora letto questo libro e che vogliano avere delle opinioni altrui. L’opinione su di un libro è molto soggettiva e per questo leggere eventuali recensioni negative non ci dovrà frenare dall’acquisto, anzi dovrà spingerci ad acquistare il libro in fretta per poter dire la nostra ed eventualmente smentire quanto commentato da altri, contribuendo ad arricchire più possibile i commenti e dare sempre più spunti di confronto al pubblico online.